Happy bank holiday everyone! 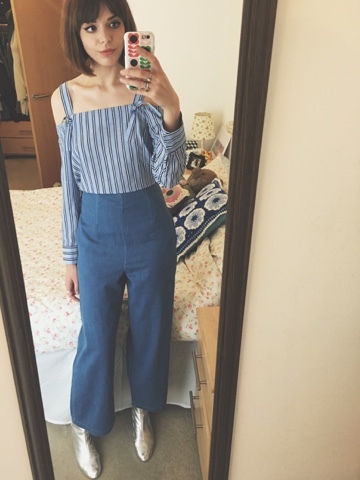 So this is kind of a quick, spur of the moment post which runs along side with a subject I've mentioned before, when I love love LUUURVE an outfit and I just gotta share it. No particular subject matter, just BAM! Killer outfit (in my opinion). 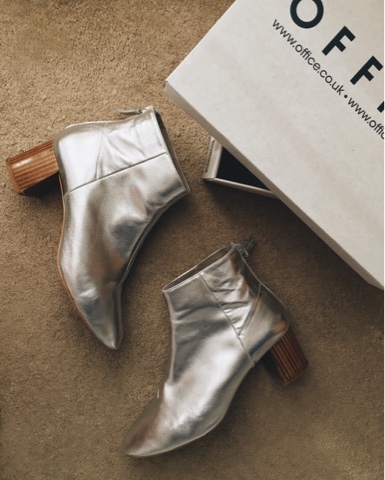 Office Silver Metallic Boots of dreams meet everyone, everyone meet my boots of dreams. As I have discussed on countless occasions now I am obsessed, addicted, in love, a collector of, whatever you want to call it, with metallic shoes. And these hit the jackpot! The wooden block heel gives them a lighter, kinda Spring/summer vibe, making them as dressy or as casual as you like. I've work them already to a multitude of occasions from; gigs to nights out, to shopping to brunch. They're money well spent and an investment worth making. So there you have my swift, on the go post, on my outfit I am wearing right now as we speak. It doesn't get more up to date than that!